Resting those weary, screen-crazed eyes. Kickstarter has become less about Oculus Rift and more about Cards Against Humanity. The ”games” category on the crowd-funding platform has attracted $495 million since Kickstarter’s inception in 2009, making it the richest segment of the site. The runners up are technology and design. The games category on Kickstarter does include video games, but these account for a minority of the amount pledged. In 2015, video games attracted about a quarter of all pledges in the category. It’s also worth noting that pledges don’t equate to actual money changing hands for projects, since some efforts never get off the ground. In 2015, there was a gap of about $10 million between the pledged amount for games and the amount that was deployed to successfully funded projects. The rise of boardgames on Kickstarter coincides with a boom in tabletop gaming generally. The size of the board game market has risen for seven consecutive years to become a billion dollar industry, according to estimates by market research firm ICv2. 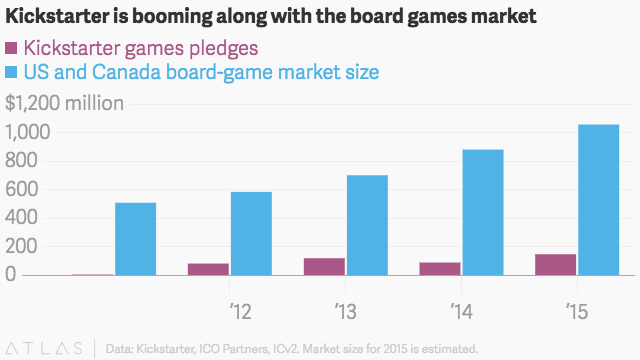 Board games may be especially well-suited to crowdfunding. Unlike digital gadgets with disastrously complex supply chains, or video-games with unpredictable development schedules, board games have well-defined components and costs. When game-makers pitch the crowd on Kickstarter, they can lay out exactly how the game works. They just need the money to pay for the tokens, boards, and boxes. ”You’re funding the production of the game, not the conception,” says Bidaux.